Facial cleansing bar with unique nylon net bag to enhance foaming. 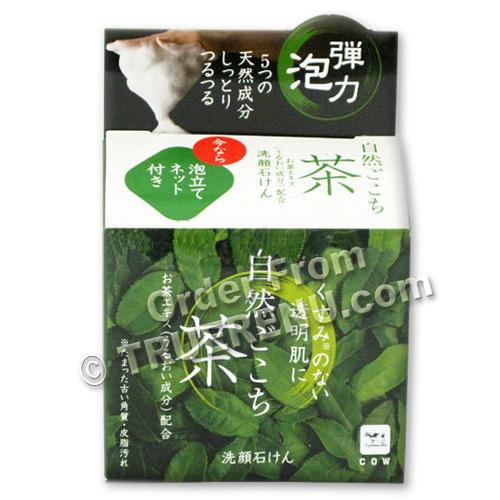 Contains premium quality green tea from Uji, Kyoto. Moisturizing glycerin soap recommended for dry skin, acne, and oily skin. Foaming net bag produces extra rich elastic lather for gentle cleansing. Contains five natural skincare ingredients: Green tea extract, Hyaluronic Acid, Collagen, Jojoba oil, and Althae Officinalis Extract. Hyaluronic Acid to protect moisture in your skin. Made in Japan, but comes with English ingredients and usage instructions. A unique facial cleansing kit that includes a special nylon mesh bag to help produce thick luxurious lather. Green Tea-based oval bar soap is specially for gentle cleansing while protecting and restoring skin's natural moisture. while restoring its natural moisture. This is another hard working, hard to find product from TrueRenu, where you'll always find knowledgeable product help, fast shipping, courteous customer service, and a 100% satisfaction guarantee on everything we sell. TrueRenu does the searching - and researching - for you. We look for hard to find, hard working products that do what they promise, and we bring them to you with detailed descriptions. Place bar soap inside of included foaming net bag, wet and create lather. Take the rich lather onto palms and massage into face gently. For more aggressive cleanse, massage with cleansing brush, pad or included foaming net bag. Rinse thoroughly with warm water. Do not use if you have scar, rash, or other skin problems. Do not store in a direct sunlight or in high temperature. Rinse immediately if it gets into eyes. Keep out of reach of children. Do not use if it does not agree with your skin. Ingredients: Bar Soap: Soap base, palm kernel acid, cocamidopropyl betaine, glycerin, camellia sinesis (green tea) leaf extract, sodium hyaluronate, hydrolyzed collagen, jojoba seed oil, althaea officinalis (marshmallow root) extract, myrystic acid, palmitic acid, lauric acid, methyl gluceth-20, polyquaternium-7, cellulose gum, fragrance, butylene glycol (BG), methicone, ultramarines, iron oxide, tetrasodium eticronate, EDTA-4Na; Foaming Net Bag: Nylon. Product Size: Net Weight, Bar Soap: 80 grams, or about 2.8 ounces.